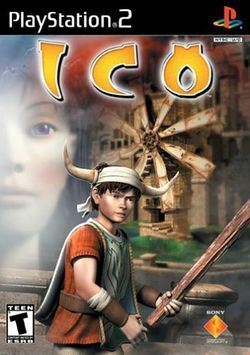 In ICO you control a young boy who has been banished to an eerie castle because of his horns, which are thought to bring bad luck to his village. Upon arriving at the castle he meets wispy pale girl. Together they work on escaping. They must solve puzzles and defeat surreal enemies. ICO was the darling of critics but had low sales. It was developed by the same developers as Shadow of the Colossus. Both games have similar art styles and game mechanics. An HD version of the game was released for the PlayStation 3 both as part of The Ico & Shadow of the Colossus Collection and as a PlayStation Network downloadable. European and Japanese cover art. This page was last edited on 22 January 2012, at 05:20.